In the interview with Edgefield County EMA Director Suzy Spurgeon, she stated, “We got lucky.” The powerful storm that has caused severe damage and deaths to the State of South Carolina over the last week took a northeastern turn before it got to Edgefield County. We received a glancing blow. Spurgeon began her two-a-day conference calls with the State EMA director Friday, October 2, and continued through Monday, October 5. She also maintained contact with power companies, dispatchers and local fire and police. The rain total for Edgefield County, which is from Friday to Monday, ranged from 3 inches in the western portion of the county to 8 inches near Johnston, with 14 inches of localized flooding. The predicted numbers had been 6 to 9 inches. Sunday morning a total of 5,600 power outages had been reported by S.C.E. & G. and Aiken Electric Co-Op. By Monday there were no reported outages in the County. South Carolina Department of Transportation had reported by Monday that all roads were open. On Sunday, Hwy. 121 near Johnston was closed for 15 hours due to trees that fell on power lines. Trees also blocked Hwy. 23 going into Johnston and Edisto Street in Johnston. In all, DOT reports there were over 100 trees down in the County due to rain and wind. Another road that had some flooding was Old Plank out of Johnston. 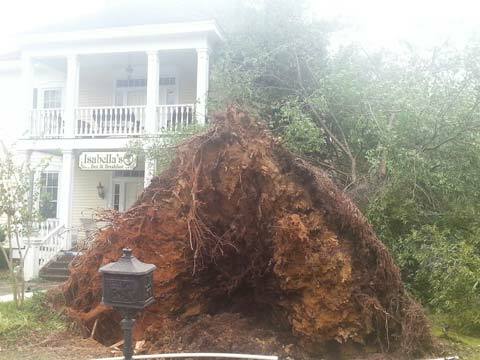 Due to the hours of non-stop rain and the fear of falling trees, most churches in Edgefield County did not open Sunday. Edgefield County School decided Sunday afternoon to close schools for Monday for student safety due to the uncertainty of the continuous rain and more falling trees and the fact that the students are out in the dark hours. Counties as Horry, Sumter, Richland, Lexington and Charleston, to name a few, did not fare so well. Rain totals were historic with over 20 inches in some areas. It was called the flood that comes every 1000 years according to Governor Haley. Suzy Spurgeon explained that when the term 1000-year flood is used it means that it is an event that has a .1% chance of occurring in South Carolina. In the state’s capital, people were trapped in homes and cars. The water supply is contaminated and could be days before water will be back even affecting hospitals. 12-hour curfews were put in place in many counties. Dams were broken, businesses and homes destroyed. Bridges, roads and interstate 20, 95 and 26 were closed in some places. Emergency shelters were set up. This system drenching South Carolina was part of an unusual combination of weather conditions involving a slow-crawling low pressure, a system meteorologists called “unusually deep” for this time of year. By Sunday, October 4, President Obama had declared a state of emergency for the state and ordered federal aid to bolster state and local efforts. If residents have received damage to their properties or homes contact EMA at 637-2123.